Technology has slowly filtered into every level of business and changed everything. This might sound like a dramatic statement, but think of one are of your business or institution that hasn’t in some way had to adapt with technology to stay ahead. Surprisingly, there are still companies out there who believe that this disruption is only relevant to technology businesses and that they can continue with business as usual. At Tuit, we like to define this disruption: “The influence on a Supply Chain by technology”. Regarding education, this refers to the change from how an institution subscribed to a certain extent the means of learning, and there was little choice for the student as he was bound by location, etc. To a shift with technology where students are now able to choose where, how and when they study – with almost an infinite number of choices. Consumers have the power of choice, and if they do not like the offering, they go elsewhere. This is where it becomes necessary, like us at Tuit, to use best of breed mechanisms to provide better education through the use of technology. 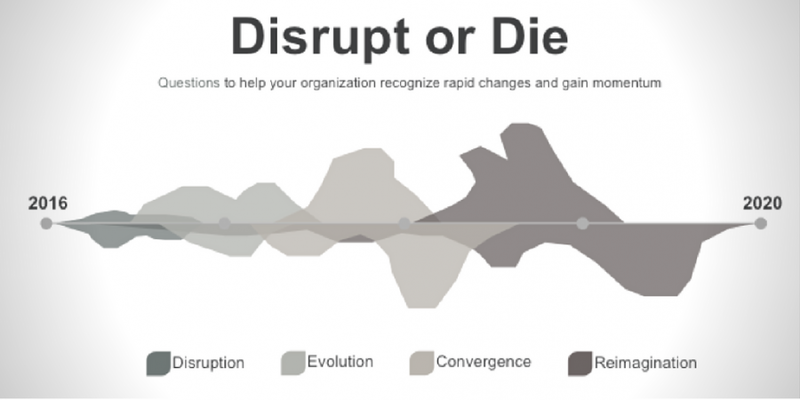 It is important to note that disruption is not a negative, but can be largely positive for companies who identify the disruption curve and plan to stay ahead of it. The traditional supply chains are broken down to create new and better ones. Awareness of the disruption allows companies to look at industry trends and use this knowledge to make a positive shift towards fulfilling the needs of their clients. We use this term to explain the change of disruption, by means of changing the middle man. This needs to be carefully considered as the audience plays a huge role in the extent of this change. When we look at education for instance, we believe the idea of a blended learning approach makes much more sense than forcing a total shift to individual online learning. Remembering that education is a social and not a technology activity. We suggest education institutions look firstly at what their students need and then re-engineer the offering to fulfill that. When it comes to developing content for an online platform, writing from scratch for an online medium is preferred above tweaking legacy content to fit into an online platform. Education providers need to have a disruption technology mindset in order to make a positive change. Digitizing processes allows for capturing data from students and in turn using this information to provide better services and make educated decisions. This is a direct line to understanding where student interests and problem areas lie. Students will gravitate to institutions that understand their needs and can offer the best solutions. Tuit can assist institutions with a clearer picture of where they fit into the supply chain and help to formulate a plan on how best to service their student’s education requirements.